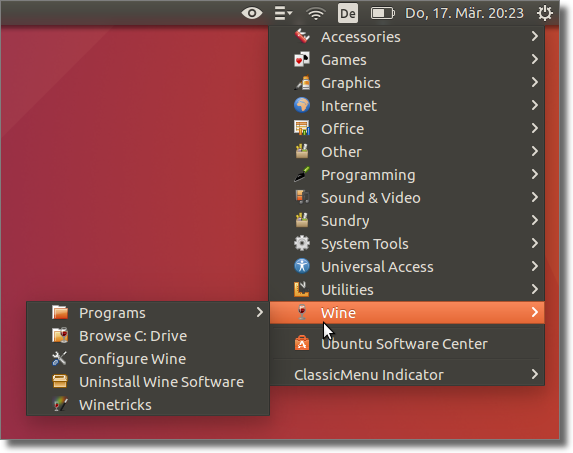 2012.11.15 ubuntu 에서 classic menu indicator를 사용하자! 2012.04.12 우분투 - 이전 설치가 완료되지 못함. 1. Ubuntu Software Center에서 canonical partners repository를 enable 한다. * 혹시 이전 버전이 설치되어 있거나, 또는 설치가 완료되지 않아 문제가 발생할 경우, sudo apt-get -f install acroread 를 실행하면 문제가 되는 패키지 정보가 출력될 수 있다. 문제가 되는 패키지를 remove한 후에 재 설치하면 됨. 한글이 출력되지 않으므로 아래 폰트팩을 어도브 사이트에서 찾아 설치한다. 위에 acroread 버전은 9.4.7이지만 아래 폰트팩도 상관없이 잘 설치된다. 파일을 다운로드 한 후에 압축을 풀고, # sudo ./INSTALL을 실행 아래와 같이 설치를 진행한다. Welcome to the Asian Language Kit installation. This installation will not work if you do not have the Unix Adobe Reader version 9.1 installed prior to this installation. If you do not have Adobe Reader version 9.1 already installed on your system please do so before installing this Asian Language Kit. 위의 파일을 수정한 후에, 각각의 디렉토리를 위에 설정한 것처럼 rename 하면 됨.
ubuntu 에서 classic menu indicator를 사용하자! custom menu를 추가하려면 아래와 같이 unity launcher에 추가하는 방법을 사용한다. custome_menu.desktop의 내용은 아래와 같은 형식으로 작성. 그래서... 아... 런쳐를 하나만 없애면 되지 않을까? 런쳐는 어떻게 없애지? 2. ~/.config/gtk-3.0/gtk.css 파일을 생성하고 아래 내용을 편집. 터미날을 재 시작. 먼저 필요한 패키지는 xinetd와 telnetd 이다. 아래와 같이 telnet deamon을 위한 파일을 작성. 하면 telnet 접속을 할 수 있다. /etc/exports 파일에서 해당 디렉토리 옵션에 no_root_squash 가 빠졌는지 확인! 우분투 - 이전 설치가 완료되지 못함. 그런 후에 다시 sudo apt-get install -f 를 실행하면 이전에 중지 되었던 설치가 실행되면서 오류가 해결됨. 위와 같이 <TAB>으로 구분되어 있으면 command가 실행될때 마다 다른 쉘이 떠서 수행됨. 따라서, 같은 쉘에서 동작시키기 위해서는 ";"로 구분해서 한줄로 써야 함. @로 시작하면 화면에 명령자체를 에코하지 않는다. 리턴값을 무시하고 다음 command가 실행됨. Ubuntu includes a very limited shortcut key configuration utility which doesn’t allow you to assign hotkeys to your own applications or scripts. To get around this limitation, we can use the built-in gconf-editor utility to assign them ourselves. First you’ll want to load up gconf-editor by typing it into the Alt+F2 Run dialog. Once in the application, navigate to the following key. If you are familiar with regedit on Windows, this is very similar. You’ll notice a bunch of values on the right. These are the available commands that you can create for assigning to shortcut keys in the next step. 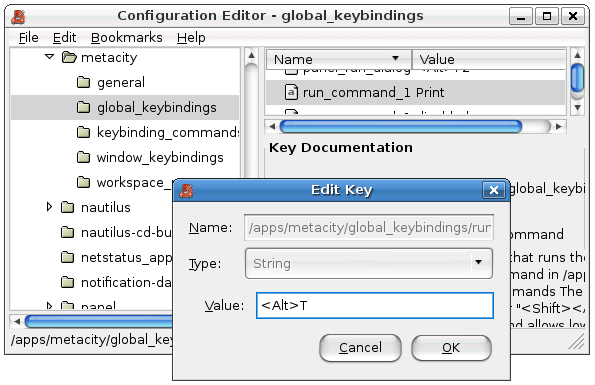 Now navigate to the key “global_keybindings”, which is directly above the one we were on. Here you will want to select run_command_1. Enter in the shortcut key in plain text. For instance, for Alt+T, you’ll do <Alt>T. You could use <Ctrl>T or <Alt><Ctrl>T, or whatever you want to assign to the key. 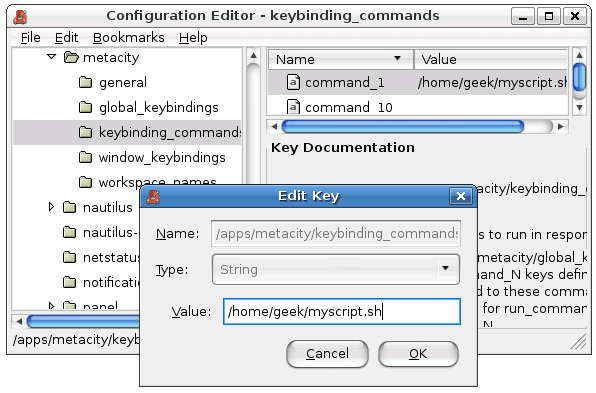 You can also create custom commands in the keybinding_commands and assign them in the global_keybindings if you want. Just remember that the keybindings will start with run_(name of command). 주의할 점은 심볼릭 링크가 만약 sym_link 라면, rm -r sym_link/ 로 하면 안됨. / 를 붙이면 sym_link에 링크된 디렉토리를 지우기 때문이다. 따라서, 심볼릭 링크만 지우고자 한다면 rm sym_link 해야 함. *** GLIB is always available from ftp://ftp.gtk.org/pub/gtk/. Trac 0.10.x 버전용 gantt plugin은 아래 저장소에서 받을 수 있다. --> 소스를 훑어보면 바꾸기는 그리 어렵지 않다. 또는 번역기를 이용하면 됨. 첨부된 파일은 한글로 변경된 파일임. 아래 명령으로 소유자를 수정한뒤 다시 접속했더니 정상적으로 접속. 설치되어 있는 TRAC 이 0.10.5 였다. 근데... TracTicketDelete를 설치 했는데... 아래 경로에서 설치 했다. 1. Do easy_install -m [plugin name] to remove references from $PYTHONLIB/site-packages/easy-install.pth when the plugin installed by setuptools. 2. Delete executables from /usr/bin, /usr/local/bin or C:\Python*Scripts. For search what executables are there, you may refer to [console-script] section of setup.py. 3. Delete the .egg file or folder from where it is installed, usually inside $PYTHONLIB/site-packages/. 쩝~ 그냥... .egg 파일을 찾아서 지우라는 얘긴가?